River, via the White Glacier and North Ridge. The usual route follows the glacier (up the true left of the icefall on an ice ramp) almost to Kahutea Col. Stay close beneath the North Ridge, to avoid the crevasse areas and then ascend the last couloir which joins the ridge near the summit. (Note : Wet snow avalanches or stone-fall are not uncommon in this short 60m couloir!). C.K. Ward and A.E. Talbot 1913. 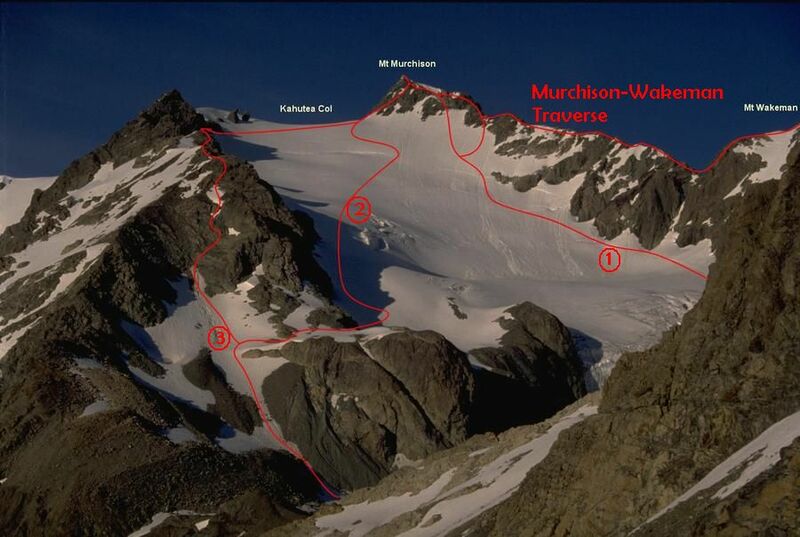 By late summer the above route may be cut by an icecliff for the width of the White Glacier. 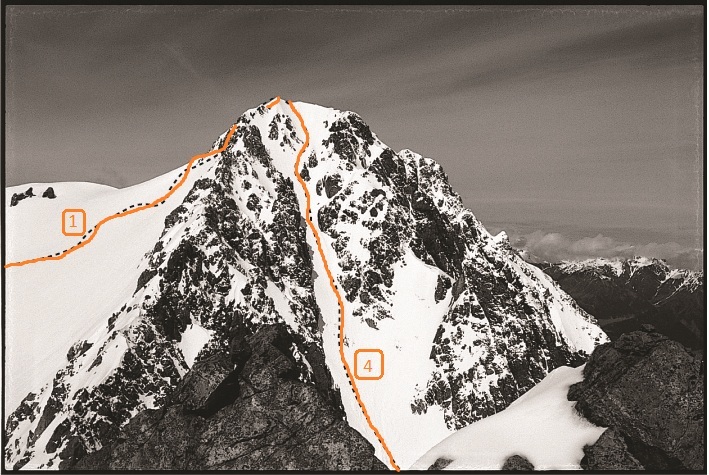 In this case a good route follows a scree/snow slope adjacent the ridge linking White Col and Kahutea Col. A cross over point onto the White Glacier neve is generally found about 200m up the ridge. In recent years (February) the White Glacier has been cut by a huge bergschrund for its entire width some 150m below Kahutea Col; rock bypasses are very risky to say the least. The Kahutea ridge can be followed from White Col however be prepared for some very loose, exposed climbs, especially on the final two buttresses. From the upper Wilberforce River via Denas Creek, by traversing upstream to a point directly below the summit rocks. A large scree leads up to a long steep couloir which meets the North Ridge not far from the summit. This route is fraught with dangers, avalanche, rock fall, and really rotten rock to name but a few. It is a seasonal route with a very narrow window of safe conditions (typically August to December, daily conditional). 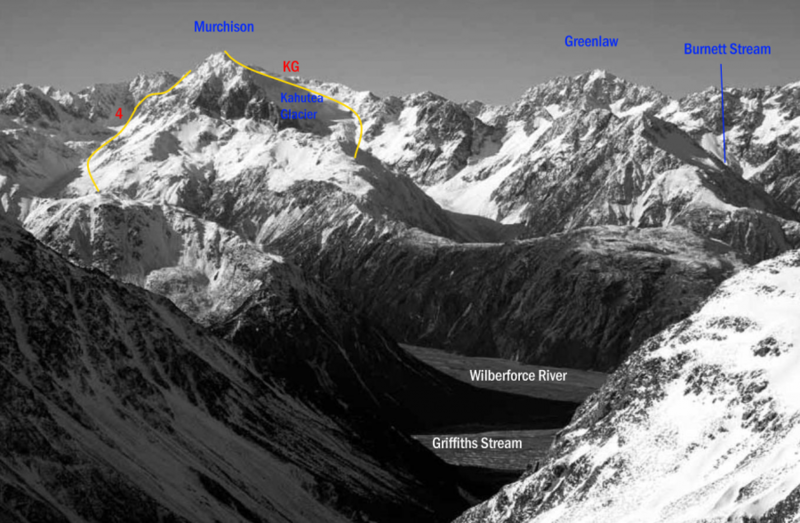 Descent is generally made over Kahutea Col, down the Kahutea Glacier (sticking true left), then sidling left diagonally down to gain the slabs and grassed slopes into Weka Stream. This climb is a duplication of the next one.